Baltimore City may be better known for its urban grit than its green, but recent redevelopment along its famed waterfront is bringing an eco-friendly edge to the city like it's never seen before. One stunning example is Pierce's Park, a multifunctional green space that combines play, stormwater management, and environmental education into a one-acre urban oasis. 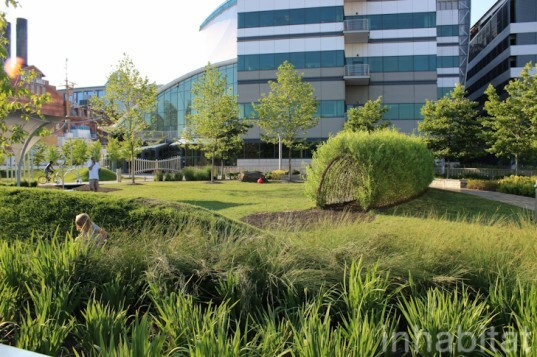 Designed by landscape architecture firm Mahan Rykiel Associates, Pierce's Park incorporates a bevy of sustainable elements such as rain gardens and recycled material into an artful space that doubles as a playground for Downtown Baltimore's families. 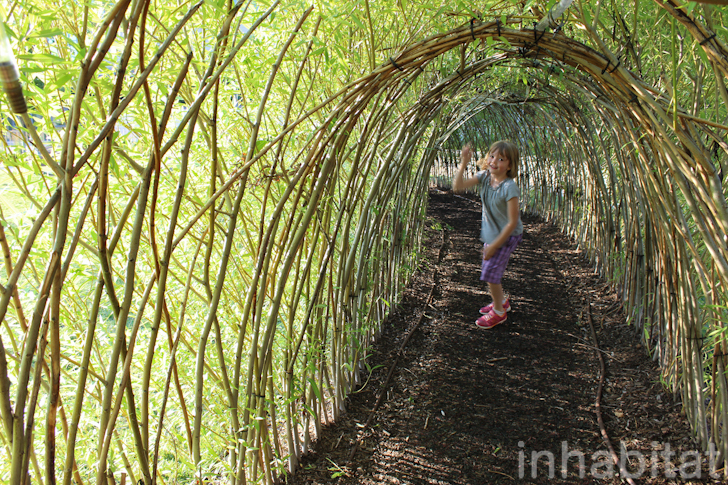 Click through to see the pictures, including a beautiful living willow tunnel you are guaranteed to love! Located on what had once been an underutilized and largely paved pass-through space along the city’s Inner Harbor, Pierce’s Park was developed to satisfy a need for a children’s play area in Downtown Baltimore. Funded with help from the family of local businessman Pierce Flanigan, for whom the park is named, the design weaves together Pierce’s passion for nature, music, language, and children. To create two separate play areas for younger and older children, the landscape architects split the park into two oval-shaped open greens, each ringed by planted earth berms and a ribbon-like pathway that meanders through the site. Given the park’s location next to the Inner Harbor, the landscape architects wanted to make a statement about cleaning the water and thus emphasized stormwater capture, treatment, and filtration in the park design. Beautifully planted bio-swales and rain gardens are accompanied by interpretative signage that explains the landscape processes as well as their additional wildlife habitat benefits. The curvilinear seating was constructed from recycled wood placed atop an eco-friendly gabion base made from cobblestone salvaged from an old city street buried beneath the site. The large boulders added to the park were donated from a local Maryland quarry. In addition to its sustainable elements, Pierce’s Park includes sculptural play equipment such as a stainless steel Horn sculpture and slide, a living willow tunnel, musical fence, and a modern playground. To celebrate Pierce’s love for language, hundreds of homophonic words are also engraved into the paving. Community involvement and volunteer efforts played a key role in constructing the park. You can see more pictures of Pierce’s Park in our gallery! To create two separate play areas for younger and older children, the landscape architects split the park into two oval-shaped open greens. The park is located near the Inner Harbor. Located on what had once been an underutilized and largely paved pass-through space along the city's Inner Harbor, Pierce's Park was developed to satisfy a need for a children's play area in Downtown Baltimore. The rain gardens collect and filter stormwater on site. One of the most popular features of the park is a living willow tunnel. Planted earth berms surround the open greens. Stainless steel signage was built in the shape of sails to allude to Pierce's love of sailing. 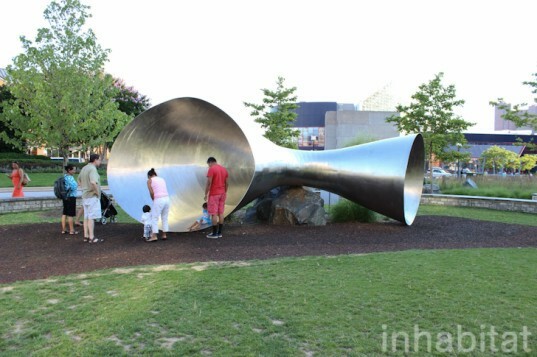 A giant stainless steel Horn sculpture doubles as a slide. An interactive musical xylophone made out of steel pipes. The musical fence lets people interact with the sensory park. Modern play equipment is also included. The curvilinear seating was constructed from recycled wood placed atop an eco-friendly gabion base made from cobblestone salvaged from an old city street buried beneath the site. To celebrate Pierce's love for language, hundreds of homophonic words are also engraved into the paving.